Today’s Printable Paper Doll Inspirations: Fashion plate From 1824, published in Ladies Pocket Magazine in January and boots like this and this. 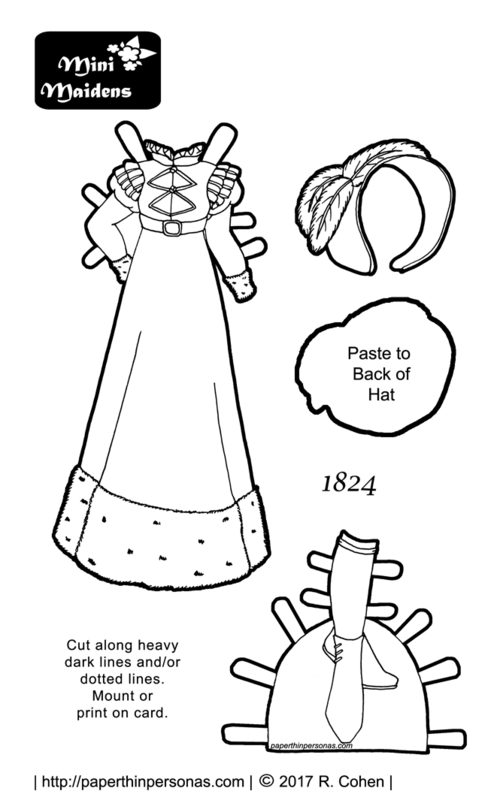 Today’s printable paper doll outfit is and 1820s dress, specifically a winter walking costume from about 1824. I don’t know why, exactly. It’s a fascinating decade and the fashions change very quickly. I think I sometimes find it a little too “frou-frou” which is odd given my love of the 1870s. If there ever was a “frou-frou” era, that would be it. This 1820s dress is based on this fashion plate. The original featured a muff the size of a small pony, but I decided to omit the muff because I couldn’t figure out how it would stay on the paper doll. I have been trying to practice my bonnet drawing skills. I am slowly getting better at them. They are surprisingly challenging to draw, but are such a critical part of 1820s dress. Along with the walking costume and matching bonnet, I drew a quick pair of simple boots from the period, examples similar to these are here from the Met and here from the V&A. You can see more examples of early 1800s dress on my Regency Pinterest Board. Oddly enough, I haven’t done any other Regency/Empire historical clothing for the Mini-Maiden paper dolls. So, that might be something worth working on in the future. Love the blog? Want to support it? Consider joining Patreon. love the bonnet ~ so simple and charming!